Remove cabbage heart and put in microwave dish with a little water and cover. Cook on high for 10-13 minutes until leaves are pliable. For filling, combine ground beef, rice, onion, egg, and salt, pepper, and milk. Mix well. Place a portion into the center of each cabbage leaf. Roll leaf around filling, burrito style Place seam side down in a baking dish. For sauce, combine tomato sauce, tomatoes, sugar, vinegar, and 1/2 cup of water; pour over the cabbage rolls. Cover and bake in a preheated 350° oven for about 1 hour. Remove rolls with slotted spoon. Place pan juices in a saucepan over medium heat; stir cornstarch and water mixture into the sauce; bring to a boil and cook until thickened. 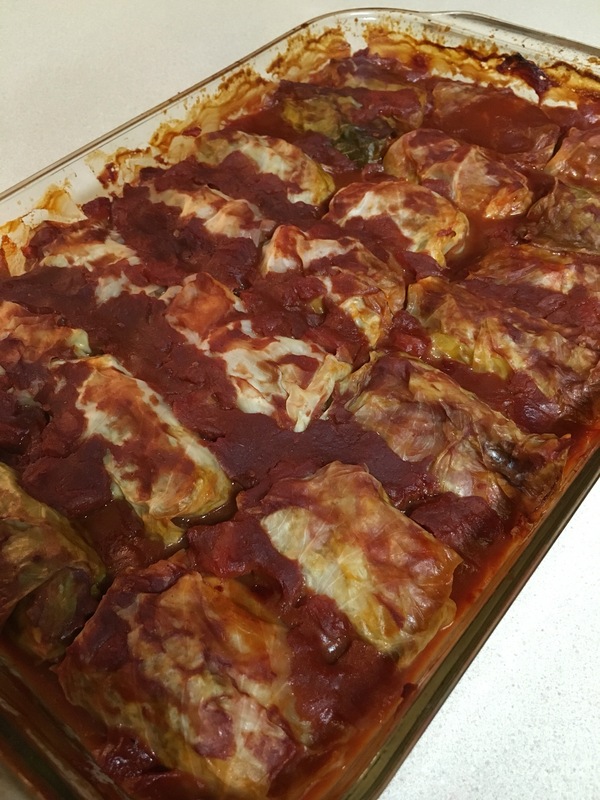 Serve the cabbage rolls with the sauce. ***I usually always add garlic powder to the meat mixture and a little hot sauce to the sauce. ***This can be easily made Keto friendly by subbing the brown rice for riced cauliflower and using stevia instead of the sugar in the sauce. This is a great make ahead meal! I usually freeze them with the sauce in foil pans with enough in each pan for one meal. Then all you have to do is thaw and bake! Next > It’s a New Year and a New Life for an Old Chair!